Internet Speed Tool is the PUP that uses misleading techniques to prevent removal. Use Reimage to locate malicious components and get rid of them faster than with uninstall instructions. A full system scan blocks virus reappearance and prevents traffic to malicious domains. How beneficial is Internet Speed Tool? How did this browser get into my computer? Internet Speed Tool virus tries to appeal to users who are looking for ways to improve the performance of their browsers. Despite how alluring the design may look and how convincing it may sound, it is not recommended to install this plug-in. IT experts label it as adware. The owner of this tool, Polarity Technologies Ltd has already made itself prominent in the virus world for making dozens of browser hijackers. It seems that it is following the steps of Imali Ltd, which earlier was active in filling the market with PUPs as well. Another negative feature of this plug-in is that it collects quite much information about your browsing habits. There is a risk of privacy violation as well. Therefore, we recommend you not to waste time and remove Internet Speed Tool. Let Reimage help you. Naturally, you might question such advice. If you have never encountered a PUP before, you might not suspect this tool of any suspicious behavior. 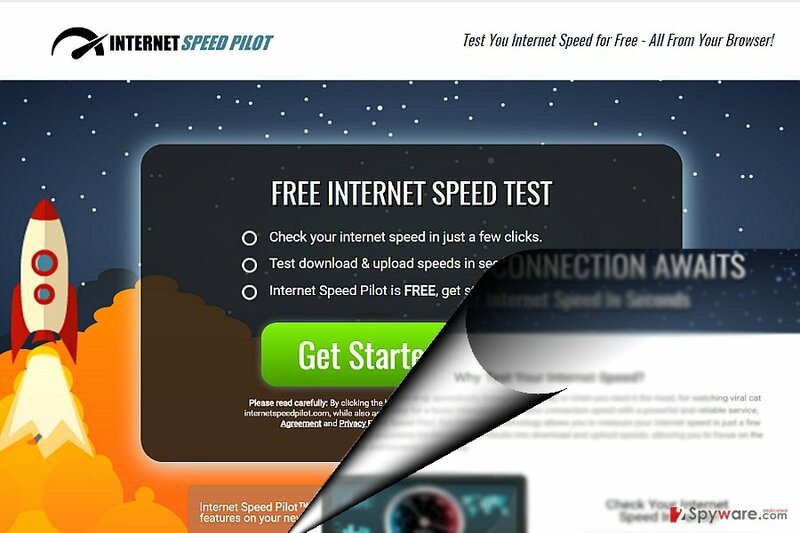 Internet Speed Tool or Internet Speed Pilot offers to test your browser’s speed for free. In case, your browser underperforms, you can download the respective plug-in and improve its performance. At least it is how the owners of this PUP want you to think. In exchange of downloading it, the admins will be aware of your browsing habits: visited web pages, search frequency, and other technical information which can identify you. Though they commit of not compiling personal information, such details might still get compiled into the collectible information. In exchange of boosting your browser's speed, Internet Speed Tool tends to spy on your browsing habits. The provisions state that the technical information might be shared with third parties and subcontractors. As a result, your Inbox folder might get overcrowded with customized messages. Note that spam messages are often the tool of ransomware developers. What is more, the authors of this company might be using the retargeting technique. In short, once you visit their web page, after a while, you might start noticing more Internet Speed Tool ads. Likewise, there is a higher chance that you click on the advertisements and get directed to their website. Needless to say, that such commercial pop-ups bother your browsing sessions. Internet Speed Tool redirect phenomenon eventually becomes an irritating tendency. If you cannot understand how this adware sneaked into your computer, let us briefly explain the distribution methods. Such programs are attached to free programs. When users launch the installation wizard, they often fail to notice add-ons pinned under “Recommended” settings. Likewise, clicking the “Install” button may only facilitate Internet Speed Tool hijack or infiltration of a similar PUP. Regardless of what program and what source you download it from, choose “Custom” settings. Watch carefully for unwanted attachments and unmark them. Note that such well-known programs as Adobe Flash Player or Java are especially prone to bear unwanted add-ons. Now lets us proceed to Internet Speed Tool removal. You are unlikely to experience any problems during Internet Speed Tool removal. Nonetheless, though the process takes only a couple of minutes, precision and attention are required to get rid of the program. Users, who encounter this threat for the first time, might opt for the automatic elimination. Install an anti-spyware program. It will remove Internet Speed Tool for you in a couple of minutes. In addition, review the list of system applications and remove the unnecessary ones to improve the overall performance of the device. Delete suspicious plug-ins and extensions from the browser as well. Here, look for Internet Speed Tool or any other recently installed suspicious programs. Wait until you see Applications folder and look for Internet Speed Tool or any other suspicious programs on it. Now right click on every of such entries and select Move to Trash. When in the new window, check Delete personal settings and select Reset again to complete Internet Speed Tool removal. Once these steps are finished, Internet Speed Tool should be removed from your Microsoft Edge browser. Make sure to remove all associated plug-ins with Internet Speed Tool does. Lastly, reset the browser. Here, select Internet Speed Tool and other questionable plugins. Click Remove to delete these entries. Now you will see Reset Firefox to its default state message with Reset Firefox button. Click this button for several times and complete Internet Speed Tool removal. Here, select Internet Speed Tool and other malicious plugins and select trash icon to delete these entries. Click Reset to confirm this action and complete Internet Speed Tool removal. Here, select Extensions and look for Internet Speed Tool or other suspicious entries. Click on the Uninstall button to get rid each of them. Now you will see a detailed dialog window filled with reset options. All of those options are usually checked, but you can specify which of them you want to reset. Click the Reset button to complete Internet Speed Tool removal process. ^ ﻿ Evan Malmgren. 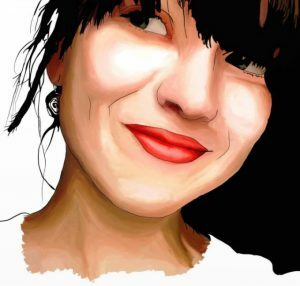 ﻿ How To Fight for Your Rights and Privacy Online. The Nation. Politics, Finances, Security. ^ Greg Masters. Spam hitting Germans with personalized messages. SC Media. The cyber security soyurce. ^ Danny Palmer. This old ransomware variant is back - with sneaky new tricks. ZDNet. News, reviews, comments for IT professionals. ^ Dan Thorp-lancaster . Microsoft issues critical Adobe Flash Player fix after delayed Patch Tuesday. Windows Central. News, Forum, Reviews, Help for Windows Phone . ^ Derek Walter. 5 ways to speed up Chrome: Tips for power users and newbies. PC World. IT news, comments, analysis. This entry was posted on 2017-03-23 at 00:05 and is filed under Browser addons, Viruses. You can quickly scan the QR code with your mobile device and have Internet Speed Tool virus manual removal instructions right in your pocket. How did you remove Internet Speed Tool virus?